To get an idea of how American coastal waters might look just before they succumb to all the degradations they have suffered these past five centuries, it would be worth taking a July trip to Mobile Bay, an Alabama inlet that feeds into the Gulf of Mexico. If the air is still and hot, an event may occur that Gulf Coast residents call a “jubilee.” The bottom-dwelling flounder will be among its first victims, growing agitated as each successive gulp of water brings less and less oxygen across their gills. In a panic, the fish will head shoreward toward the only breathable water they can find—the tiny oxygenated riffle the sea makes as it bumps lazily against the beach. At the shoreline, they will find humans waiting for them armed with “gigs,” crude sticks with nails protruding. With an easy stab, each gigger will impale a suffocating fish, sometimes two at a time. 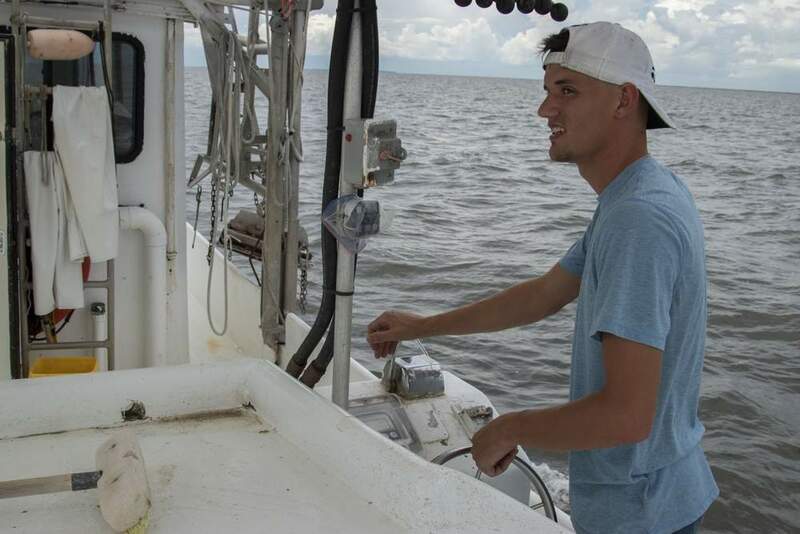 Wading out farther, the fishermen will find sluggish pods of blue crab and brown shrimp. As the bay slowly asphyxiates and the free-for-all reaches its climax, the human whoops coming from the darkness will give the impression of a happy time—a celebration of the ocean’s seemingly endless gifts. That this suffocation is taking place atop one of the most important commercial fishing grounds off the United States is alarming. 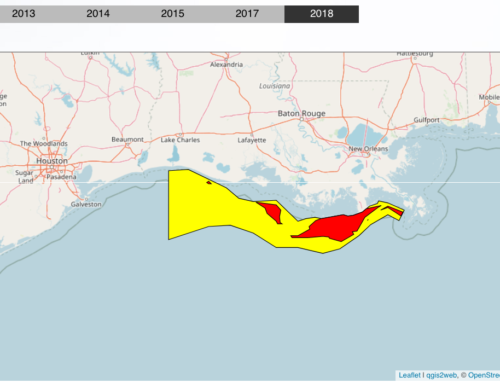 Yet, as environmental issues go, the Gulf dead zone, indeed all dead zones around the world, remains persistently below the public’s perception. Unlike strip-mining or deforestation, the Gulf dead zone is hard to observe. It forms miles from shore in an area only fishermen and oil prospectors frequent. And unlike other ocean problems, such as overfishing and off-shore oil drilling, no immediate culprit can be identified at the scene of the crime. But there is something about dead zones that makes them different from many other seemingly intractable environmental crises: Dead zones can be fixed. As the international dead zone researcher Laurence Mee points out, the Black Sea dead zone—then the world’s largest—vanished in the 1990s when the Iron Curtain countries bordering the Danube River collapsed and fertilizer subsidies fell. Indeed, as the Danube/Black Sea system showed, the equation is simple: Turn off the flow of nutrients into rivers, and dead zones go away. The question for Americans is, can we save our coastal waters before they choke to death? The collapse of the Iron Curtain countries, not choice, salvaged what remained of the Danube/ Black Sea ecosystem. Americans, though, will have to choose to eliminate their dead zone. Nitrogen-based fertilizer, used for commodity crops hundreds of miles north of the Gulf, is a primary cause of the dead zone. It takes 195 pounds of fertilizer to grow an acre of corn. Photo by Dennis Chamberlin. Corn prices are now 300 percent higher than they were a decade ago. With these kinds of prices, corn begets more corn; because it is so valuable, corn has become just about the easiest crop to insure, something that makes planting anything else a considerable risk. Add to this costs that have spiraled along with corn prices, and many farmers are caught in a bind. Nevertheless, whether you find yourself outside the Highwater plant in Lamberton, Minnesota, or a few miles up the road in Walnut Grove at one of the county’s railroad corn transportation hubs, you have the impression that the Mississippi has faded from the consciousness of a region that once depended upon it. A river-oblivious industrial infrastructure has been overlaid on the American heartland, where a golden torrent of corn flows east and west by rail or truck, servicing alternately the movement of hydrocarbons in and out of refineries or the transfer of goods to and from China. This redirected flow of money has dramatically affected how farmers treat their land and correspondingly, how they treat the Mississippi. Up until corn prices’ recent surge, a government initiative called the Conservation Reserve Program (CRP) did a lot to keep dead zone–forming fertilizers from entering riv- ers. The CRP pays farmers not to farm highly erodible lands. Another government initiative, called the Wetlands Reserve Program, fosters the restoration of wetlands that have previously been farmed. Wetlands sequester and process fertilizers by giving wild vegetation a chance to process runoff and transform those nutrients back into gaseous nitrogen; if kept in forest or prairie, steep slopes prevent nutrients from flowing into watersheds. The price farmers were paid to refrain from farming these marginal lands usually bested what farmers could earn from planting corn in them. Throughout the postwar years, nutrient runoff was kept somewhat in check. But today with Asian and ethanol buyers competing for corn, crop prices are now higher than any government conservation program can pay. Much of the land that was key to preventing nutrients from entering the Mississippi is now getting planted. Brian Hicks, though, is trying to find a compromise. As we cruised his fields in his 4×4, we came to a three-foot-high metal box that offers a window into the heart of the problem as well as perhaps a solution. Few of us are aware when we fly over the grid of farmland in the Mississippi Valley that beneath that grid lies another grid—a human-created reworking of the Mississippi’s natural drainage system known as “tiling.” “In Minnesota before settlers arrived, we had 18 million acres of wetlands,” says Jeff Strock, a professor at the University of Minnesota, who works with Hicks on several nutrient-retention experiments. “But when people moved here, water was seen as the common enemy.” Starting in the 19th century, pioneer towns were tiled in an attempt to drain off standing water that was associated with diseases and mosquitos. The practice soon spread to agriculture. Farmers began laying clay pipe beneath wetland to make land suitably dry for planting. Today, something like 80 percent of Midwest cropland has been tiled with even more efficient plastic pipe, routing water off the land and fertilizers into drainage ditches. These empty into tributaries of the Mississippi. Jeff Strock, from the University of Minnesota, and farmer Brian Hicks are collaborating on experiments to keep nutrients in the soil and out of waterways. This station measures surface runoff and provides data for reforming farm practices. Photo by Dennis Chamberlin. The Mississippi has suffered many ills requiring solutions that go beyond agriculture. 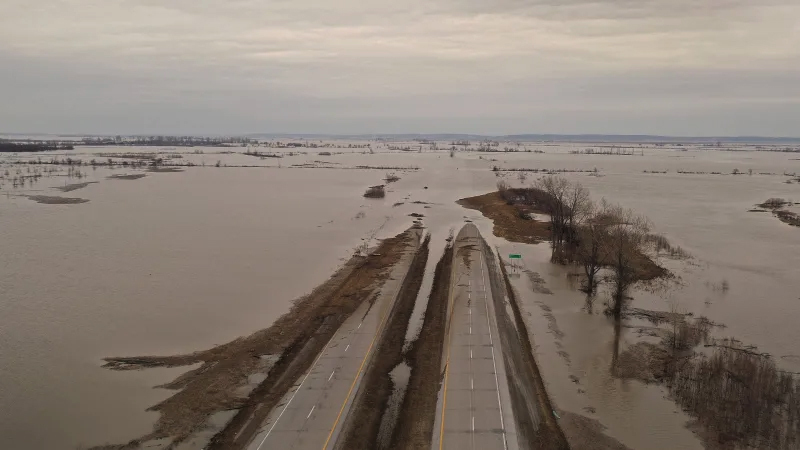 A thousand miles downriver from the corn-growing heartland, I tried to get a sense of what those other options might be—what else we could do to get out of our dead-zone predicament. I found part of the answer in Vicksburg, Mississippi, where I met up with Paul Hartfield, a spry 63-year-old biologist with the U.S. Fish and Wildlife Service. Hartfield has been working on the river this past quarter-century, doing everything from tracking the endangered pallid sturgeon to cataloging freshwater mussels to mapping the migrations of shrimp that once traveled from the Gulf of Mexico all the way north to Ohio. Paul Hartfield, photo by Dennis Chamberlin. As we set out in a battered skiff, he explained how the degraded condition of the lower river got that way. 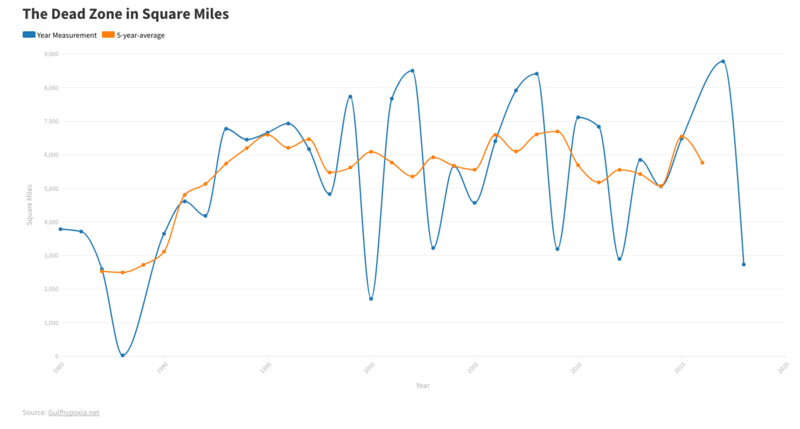 “Once upon a time,” Hartfield said, “we had a floodplain that was over 100 miles wide. 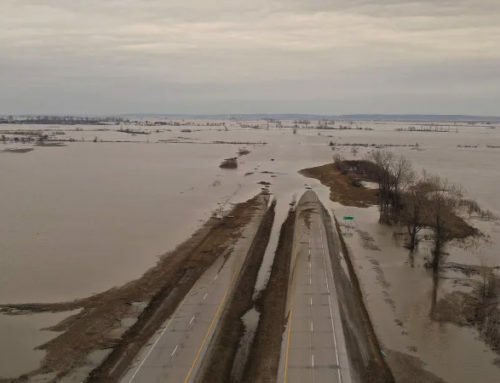 Now along most of the river it’s probably not more than five.” In the past, the river regularly overflowed its banks, allowing nitrogen and phosphorus to spread out into a vast floodplain. When it did this, the current slowed, sediment settled, and the water became clear enough for sunlight to penetrate. This would allow photosynthetic algae to bloom and process nutrients. As a result, a significant part of the nutrient load was con- sumed before it could reach the Gulf of Mexico. Decisions made 150 years ago, though, have largely destroyed all that. 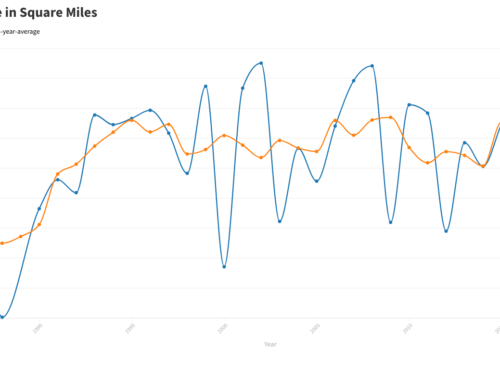 Eads’s most devastating idea was even more radical: Turn the river from a lazy wandering affair into a straight line. Although this did not occur in Eads’s lifetime, his proposal was taken up after the record flood of 1927. Throughout the 1930s and 1940s, the Army Corps of Engi- neers systematically lopped off what had been called “The Greenville Bends” and a dozen other large river bends, shortening the river by 150 miles. Floods were indeed reduced, but afterward the lower Mississippi transitioned from being a complex marshy wetland into a fire hose that blasted nitrogen and phosphorus straight into the Gulf. It is this fire hose that Hartfield is hoping to adjust. In a little while, we turned into a different habitat called a “backswamp.” Carefully he guided the boat through an eerie forest of half- submerged trees. A pair of green and red navigation buoys and other random refuse, which had been flushed from upstream, bobbed by. “This is a peaceful spot to contemplate the dissolution of the elements,” Hartfield mused. All the money in the world, though, is not at Hartfield’s disposal. But tens of billions of dollars could be there for him and other river delta dreamers. That is, if BP will ever settle the Clean Water Act lawsuit it faces in the wake of its 2010 Deepwater Horizon oil spill. But as I stepped into the Federal Court building on Poydras Street in New Orleans, a few blocks west of the Mississippi, it seemed clear that BP, having paid out $10.7 billion to environmental groups, fishermen, and other private and public entities, had no great desire to spend money on the river or improved agricultural techniques or any other thing besides its own legal defense. BP had recently balked at a $16 billion settlement offer from the Environmental Protection Agency. In the grand balconied federal court building, thousands of dollars in legal fees were pouring through the floorboards as 20-odd lawyers and other suited professionals listened to mind-numbingly boring testimony by Transocean’s chief electronics technician aboard the Deepwater Horizon on an “integrated automatic control system” and how it may have allegedly been disabled. This felt surreal given the much more urgent alarm system blaring from the failing Mississippi Delta. For thanks to a combination of a half-century of bad behavior by the oil industry and the changes to the Mississippi’s course, the land where the Poydras Street courthouse sits is in danger of disappearing. 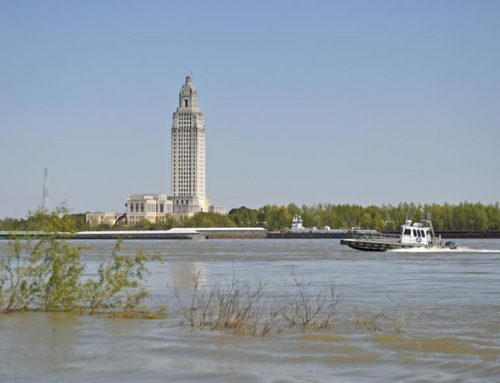 The state of Louisiana is currently losing delta land at a rate of one-third of Manhattan a year, land that was once critical to preventing the Gulf dead zone. The Lake Hermitage project will eventually build 650 acres of marshland in the Mississippi Delta, but whether man-made wetlands will last or reduce the Gulf dead zone remains a much-debated question. Photo by Dennis Chamberlin. Just as the Mississippi floodplain upstream has been radically altered by engineering, the boot of Louisiana in the far south, once the largest chunk of marshland in the continental United States, has been markedly changed by engineering. The wild, pre-20th-century Mississippi, with its constantly shifting watercourse and wide floodplain, built much of Louisiana. But now that the river has been leveed, sediment shoots out into the Gulf ’s deeper water and builds nowhere near the amount of land it used to. Added to this are the incursions by the oil companies that some scientists believe are even more devastating than the river’s containment. As Rowan Jacobsen notes in his book Shadows on the Gulf, throughout the 1950s, oil companies built pipelines and shipping channels to facilitate the delivery of petroleum offshore to inshore refineries. Once channels were dug, water flows were altered. Natural winding shallow channels were replaced by man-made straight deep canals; the levees of the dredged materials were built in an unbroken line parallel to the canals. These “spoil banks” interrupted what’s known as sheet flow across the wetlands, rotting them from the inside out. The Louisiana marsh, that great nutrient filter at the end of the river, is falling apart. The BP oil spill, of course, is not directly responsible for land loss or, for that matter, the Gulf dead zone. But the money that comes out of the BP suit could do a lot toward fixing both. 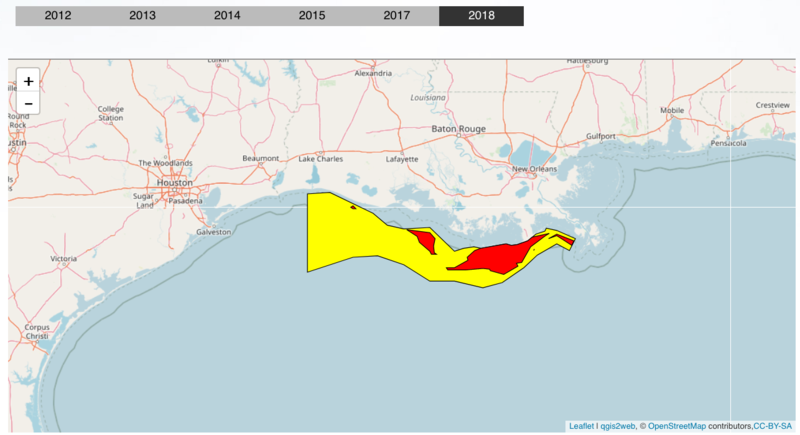 The state has drawn up a “Comprehensive Master Plan for a Sustainable Coast,” a 50-year, $50 billion effort that seeks to stop Louisiana from sinking into the sea and by extension decrease the dead zone. A major part of the plan is the granddaddy of all dead-zone mitigators: the rebuilding of the Louisiana marsh, an area so degraded that it requires not just a nutrient dialysis machine but a multibillion-dollar kidney transplant. “There’s been some work on nutrient assimilation capacity of coastal wetlands,” Richard Raynie, senior scientist with the authority, told me as we tromped around the brand new mud. “The numbers we’ve seen show that when you divert river water through wetlands, as much as 45 percent of nitrogen can be removed and assimilated.” While Raynie can’t say how much of the Mississippi’s total nitrogen load could be removed by a fully restored marsh, the hope is that it will be considerable. That hope is fueled by a recent study Raynie mentioned that found that nutrient assimilation within vegetated wetland soils may be as much as ten times higher than that within degraded open water soils, which result from marshes falling apart. Natural marshlands like Bayou Bienvenue, a few miles from New Orleans, filter the nutrients coming down the Mississippi. Photo by Dennis Chamberlin. What is real and what is mirage? 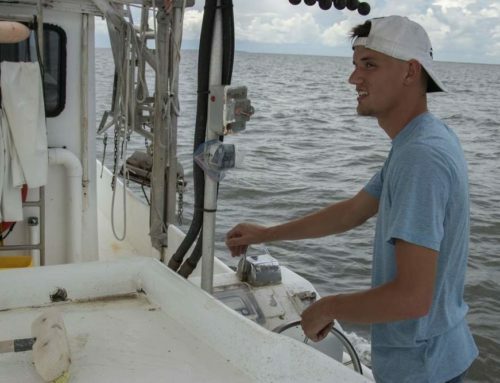 What will fix the Gulf dead zone and what will just seem like it’s fixing it? These questions dogged me as I skirted the edges of the Mississippi and wandered into the bureaucracy that attends it. At the end of my research, I sat down in Baton Rouge with MacArthur Foundation “genius” grantee Nancy Rabalais and her husband, R. Eugene Turner, two scientists who perhaps more than any others have awakened the public to dead zones. In talking to them, it is easy to get the impression that no matter what we did in the delta, nothing could accommodate the growing flood of nutrients being unleashed in the upper valley. To them, even something as nice sounding as “Louisiana marsh creation” carries within it the biblical fall Wes Jackson had mentioned: the moment when we turned to the industrialization of our agricultural heartland. “Those sediment diversions bringing in inorganic matter,” Turner told me, referring to all that expensive plumbing and land building at West Pointe à la Hache, “are filled with the effluent of nitrogen-rich fertilizers of industrial agriculture. In the end, the diversions don’t help the marsh but harm it. The plants that grow in these new marshes will have shallower roots, because they don’t have to go looking for nutrients, and the organic soils decompose faster.” Pointing to the 55 square miles of marsh lost during Hurricane Katrina, he and Rabalais doubt that the rebuilt marshes will last, and they are not optimistic about their capacity to assimilate nutrients. Later, as my homeward-bound plane rose above New Orleans and arced low over the Mississippi Delta and the Gulf beyond, I thought of the life they contain. All the shrimp, oysters, flounder, crab, snapper, tuna, swordfish—a cornucopia, an expression of the very hope of the New World, full of wild food that satisfies millions of stomachs and could satisfy many more if the waters were treated better. And I thought of the Black Sea, a sea of the Old World, which was once as rich, a sea that humans pushed to its breaking point before their societies collapsed. The dead zone in the Black Sea has indeed been fixed. The sea has come back to life, but only to a point. According to scientists who studied the Black Sea’s transition, the communities that once lived there will never fully recover. Invasive jellyfish have taken up residence since its waters were re- oxygenated, and its once-rich mussel beds no longer pave the sea’s floor. Yes, fish, mostly little ones, still swim in the Black Sea. An important anchovy fishery persists. But the big fish are mostly gone, the food chains are broken, and the great seafood economy, famous since the time of Byzantium, is now a matter of history. This story was originally published at The American Prospect. Photos by Dennis Chamberlin.